That's my other car, er, one of my other cars. So you can go back in time to when your parks were hip? As always I love how simple you keep it, yet so detailed at the same time, its very hard to say but you have a distinct style that is exclusively yours. I just saw the Vertigo video and that was good. However, I do have a question about the bathroom at the 40 second mark. Is that available on the workshop? No, sorry. Nothing in my parks is available on the workshop, unless it's something I downloaded myself. My full parks will be available once they're finished. No problem. I was just curious if it was. Loving the re creation! It is noticeable however how much faster the RCT3 version was. Thus, the only way Frontier could speed up the reload cycle would be to allow new peeps to board, and the train to leave, before the old peeps are off the platform. But how realistic would that be? This is actually exactly how several Maurer Sohne coasters operate. Some with conveyor belt boarding platforms so the car never even has to stop at the station, and some that stop only momentarily for release of the riders. Safety checks done while the car is in motion. If you'd like to see a video, here's the promo for their s-coaster that gives glimpses of station operation. Aside from all that. Shyguy, this is brilliant. The way you are combining pieces is giving me great ideas on how to get the most out of this game. I love your conversions! 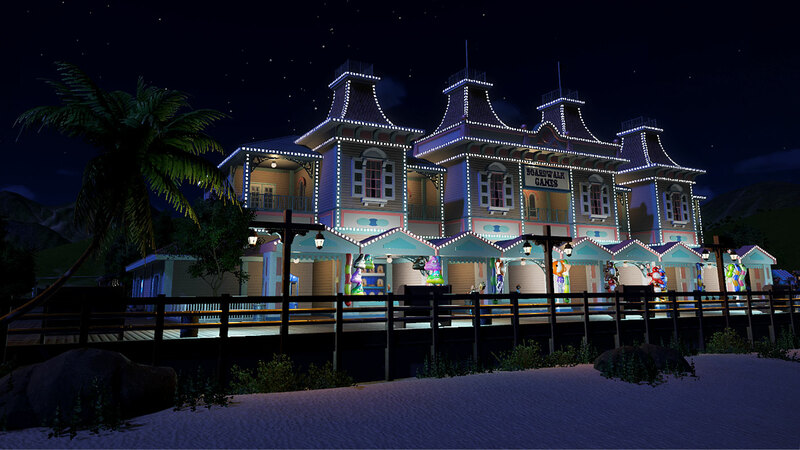 You do such a great job making RCT3 CS into PC! Ahh this park takes me back. Good to see you re making it from scratch. Your building style is amazing, loving all of the details that are going into this. Looking forward to seeing more! PS, Did you ever continue your water park on RCT3? Thanks everyone, for the nice comments. I really appreciate it. Water World never became what I had envisioned it to be. Maybe it will, if we get a Soaked type expansion for PC. 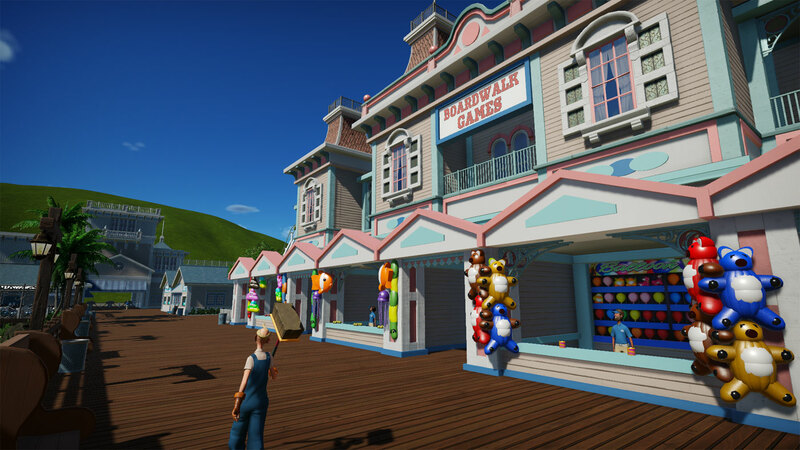 Work has resumed on this park with the Boardwalk Games building nearly complete. Game prizes are by Fisherman and Paulsey. Also very interesting to see the comparison. I like it a lot! I too, like the comparison. The PC version has brighter colors, more detail, more realism. 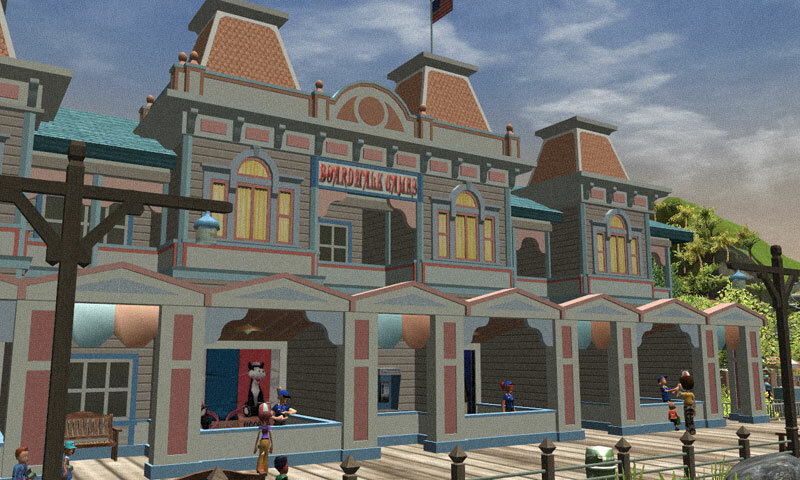 But it's actually very similar to the RCT3 version. The structure and trim is nearly the same. that is great. love the redo and the side by side compares. Glad to see Mr. Wonder is back in business! Given the unfortunate events on Quarantine Island, I was afraid we'd seen the last of him. Or is this the work of Disney's Head on Mr. Wonder's body? After all, Mr. Wonder was in the care of Nicotinan witchdoctors in his "golden hour" immediately after his tragic accident. Adding Dr. Frankenstein's technology to their native voodoo, they can accomplish things thought impossible by "modern" western medicine. This is looking great. It has your stamp all over it. "I guess this is why the hairs on our neck stand up every time we walk into a Sears." FAIRLY ODD FANS FOR THE WIN! I love what I see, great summery vibe! It's also so exciting to see those legendary Main Street Set cornice caps and other stuff in real life. Oh, I mean, in Planet Coaster. 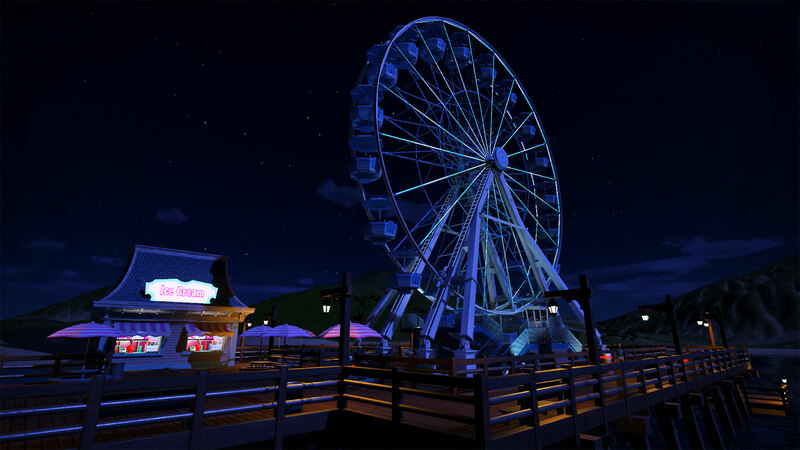 I love when you compare your works in Planet Coaster with those in RCT3. Amazing job boss, your creations have always been an inspiration for myself and many of the SGW members! Thanks guys, for all the inspiring comments. It helps me get back into Planet Coaster after about a 3 month needed break. 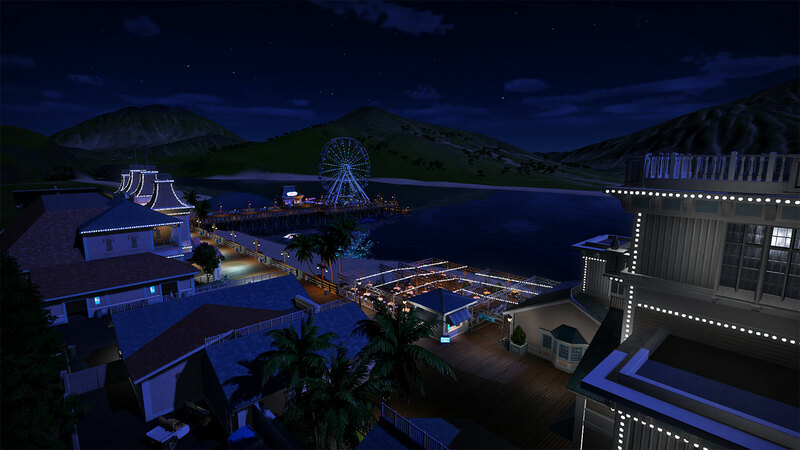 Boardwalk Games lit up at night! Ooh! *Eyes glaze over looking at the pretty strip lights. * I wonder why that is? The strip lights, I mean. Why do they add so much interest and beauty to a structure (here, and in real-life)? The general lighting looks nice, but it's the outlining of the buildings that really catches one's eye and makes you go (loop back to the beginning of this post). I so badly want to light one of my buildings like that. I really like that first photo in the previous update with the coaster peeking up between the two beachfront structures. And you know how much of a sucker I am for clever night-lighting; those roof spires are a pain to light. Great to see you back in the game. I'm not a fan of Jeronimo Park and would much rather give Mr. Wonder some more recovery time so he can come to PPII. Hopefully by then there will be more bars and pools for Wanda. That's perfect! The whole point of Mr. Wonder's shows is to not be a fan of the park in the show . As to Mr. Wonder's (or at least what was left of and/or added to him) recovery, of course he's already up and kicking. After all, from the moment of his tragic injury he was in the capable hands of surgeons trained in cutting-edge Victorian mental and physical medical care, including all the offshore, unpublished works of Drs. Frankenstein and Jekyll, and whose substantial knowledge-base was further augmented by the tried-and-true animistic practices of both imported voodoo and native shamanism. As an animist myself, I can think of no better doctors this side of the Spirit World and few even there. Wonder Beach Boardwalk gets a pier.